If you&apos;ve ever been on the hunt for the best dinghy for your boat, or the next dinghy for your boat, you know that the options are endless. You can choose the classic standby inflatable; go for a more robust RIB (rigid inflatable boat); you can opt for fiberglass molded boats; aluminum tenders; custom-made dinghies; and of course there are the multi-purpose dinghies. In the category of fiberglass molded tenders, you might consider the USCG-approved, hand-laid fiberglass boats built by Rigid Boats of Fort Meyers, Florida. Having seen these boats many times at Trawler Fest and national boat shows, there is no doubt they stand apart from a traditional dinghy. But it was interesting to learn from Rigid exactly what makes them different. Part of the Federal Boat Safety Act, which was passed in 1971, authorized the USCG to establish construction and performance standards for manufacturers of recreational boats including placement and display of capacity information, safe loading, safe powering, and flotation standards. These standards apply to monohulls less than 20 feet and do not apply to inflatables. Because Rigid Boats are built from biaxial fiberglass and special composite materials used in the transom and backing plates for all hardware mounting, they are dinghies that do not fit the inflatable category. The construction methods they use and the Coast Guard-approved two-part polyurethane foam flotation in the deck of every boat give Rigid Boats the characteristics required to pass for USCG approval. Testing was done at a certified USCG testing facility in Solomons, Maryland, on each of the five models that Rigid offers: 8 ½, 10, 12, 14, and 17 feet. 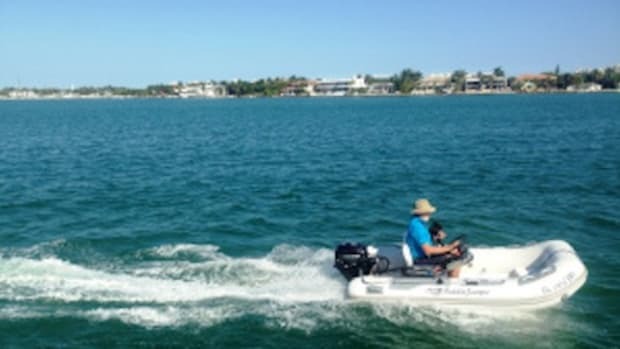 Company owner Art Link shared information on the testing done on a 14-foot Sport model with a manufacturer rating for a 50hp outboard, a three person or 450-pound person capacity, and a maximum weight capacity of 830 pounds (total weight for people, engine, fuel, battery, and gear). The boat was tested for compliance in: horsepower rating, maximum person capacity, maximum persons in pounds capacity, flotation test for persons capacity, stability test on both starboard and port sides, and level flotation without weights for persons capacity. The Rigid Boat passed each test for outboard boats successfully. Testing was done with pig iron, which is a product made from smelting iron ore with coke (a solid carbonaceous material) and resin, and is used as the weight to test the boat&apos;s strength and capacity. Pig iron was used as a substitute for the weight of people on board, the motor weight, and the weight of the fuel. 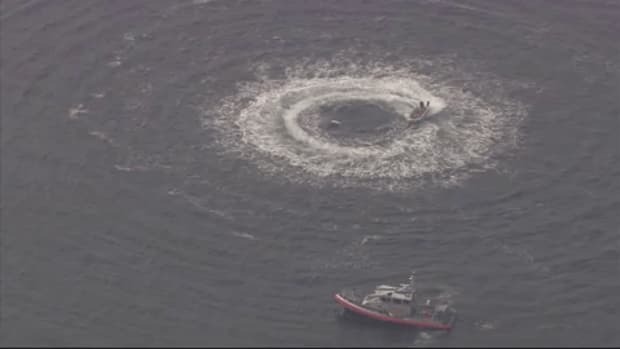 (According to the USCG documentation for this test, pig iron as the weight of fuel is placed over a sealed, empty fuel tank. For submerged pig iron to produce the same force as one gallon of gasoline, a factor of 7.1523 pounds of dry pig iron was used.) Testing is done with the boat, battery, and motor dry as well as in various submerged and swamped scenarios. At the total weight of 4,150 pounds the boat had .2 inches of freeboard remaining and it took up to 4,185 pounds to push the tender to 0 inches of freeboard. While Rigid Boats may look similar to RIBS or other tenders, the fiberglass construction makes them inherently different. Though you will have to compromise for storing a dinghy that doesn&apos;t deflate, there are certainly bonuses to this type of boat. The tubes are dedicated storage locations, cleaning fiberglass is done easily, and the V-shaped hull offers impressive tracking and performance. Watching a new video on rigidboats.com you can see a variety of the boats under power, at speed, turning over wakes, and they appear to keep right on track, turn easily and not too sharply, and do not ride bow high restricting the operator&apos;s line of sight. 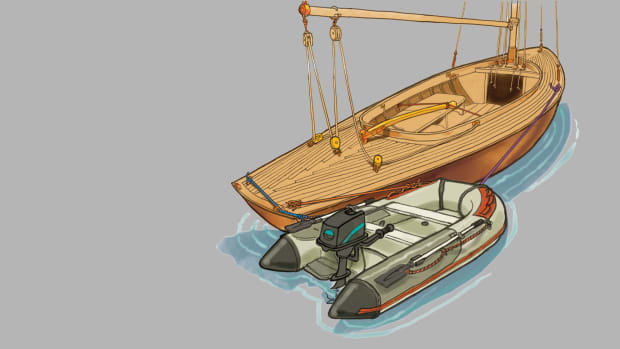 Choosing from either the Sport model line or the Tender model line, boats are built in sizes from 8-1/2 feet to 17 feet. Prices range from $4,000 to $18,500 and there are a variety of options and accessories available for these boats as well. 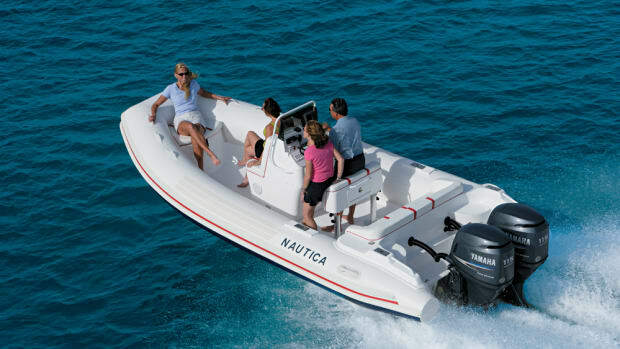 The Sport models feature a center console steering station and running lights and the Tender models are a simpler version with tiller operated outboard. Combine the peace of mind that a USCG-approved dinghy has to offer with its stable construction and high-quality components and you just may have found your next tender.